As technology developed it was realized that the output of a CRT display was more flexible than a panel of light bulbs and eventually, by giving control of what was displayed to the programme itself, the monitor itself became a powerful output device in its own right. By the end of the 1980s color CRT monitors that could clearly display 1024 x 768 pixels were widely available and increasingly affordable. During the following decade maximum display resolutions gradually increased and prices continued to fall. CRT technology remained dominant in the PC monitor market into the new millennium partly because it was cheaper to produce and offered viewing angles close to 180 degrees. CRTs still offer some image quality advantages over LCDs but improvements to the latter have made them much less obvious. The dynamic range of early LCD panels was very poor, and although text and other motionless graphics were sharper than on a CRT, an LCD characteristic known as pixel lag caused moving graphics to appear noticeably smeared and blurry. The first standalone LCDs appeared in the mid-1990s selling for high prices. As prices declined over a period of years they became more popular, and by 1997 were competing with CRT monitors. 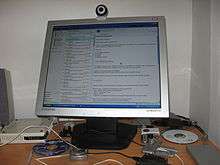 Among the first desktop LCD computer monitors was the Eizo L66 in the mid-1990s, the Apple Studio Display in 1998, and the Apple Cinema Display in 1999. In 2003, TFT-LCDs outsold CRTs for the first time, becoming the primary technology used for computer monitors. The main advantages of LCDs over CRT displays are that LCD's consume less power, take up much less space, and are considerably lighter. The now common active matrix TFT-LCD technology also has less flickering than CRTs, which reduces eye strain. On the other hand, CRT monitors have superior contrast, have superior response time, are able to use multiple screen resolutions natively, and there is no discernible flicker if the refresh rate is set to a sufficiently high value. LCD monitors have now very high temporal accuracy and can be used for vision research. The resolution for computer monitors has increased over time. From 320x200 during the early 1980s, to 800x600 during the late 1990s. Since 2009, the most commonly sold resolution for computer monitors is 1920x1080. Before 2013 top-end consumer products were limited to 2560x1600 at 30 in (76 cm), excluding Apple products. Apple introduced 2880x1800 with Retina MacBook Pro at 15.4 in (39 cm) on June 12, 2012, and introduced a 5120x2880 Retina iMac at 27 in (69 cm) on October 16, 2014. By 2015 all major display manufacturers had released 3840x2160 resolution displays. 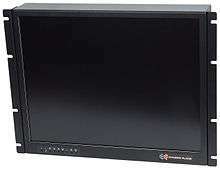 An open frame monitor provides the LCD monitor and enough supporting structure to hold associated electronics and to minimally support the LCD. Provision will be made for attaching the unit to some external structure for support and protection. 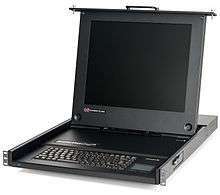 Open frame LCDs are intended to be built in to some other piece of equipment. An arcade video game would be a good example with the display mounted inside the cabinet. There is usually an open frame display inside all end-use displays with the end-use display simply providing an attractive protective enclosure. Some rack mount LCD manufacturers will purchase desk-top displays, take them apart, and discard the outer plastic parts, keeping the inner open-frame LCD for inclusion into their product. ↑ "Cathode Ray Tube (CRT) Monitors". Infodingo.com. Retrieved 2011-05-20. 1 2 "CRT Monitors". PCTechGuide.Com. Retrieved 2011-05-20. ↑ "TFT Central". TFT Central. 2011-04-30. Retrieved 2011-05-20. ↑ "Is the LCD monitor right for you?". Infodingo.com. Retrieved 2011-05-20. ↑ Agoraquest, LLC – The only place for the Sony Enthusiast. "Sony's Outs Two New OLED Monitors". Agoraquest. Retrieved 2011-05-20. ↑ "Product Planners and Marketers Must Act Before 16:9 Panels Replace Mainstream 16:10 and Monitor LCD Panels, New DisplaySearch Topical Report Advises". DisplaySearch. 2008-07-01. Retrieved 2011-05-20. 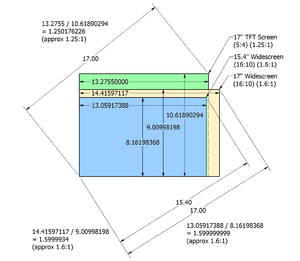 ↑ Widescreen monitors: Where did 1920×1200 go? Mybroadband.co.za (2011-01-10). Retrieved on 2011-12-24. ↑ Monitors/TFT 16:9/16:10 | Skinflint Price Comparison EU. Skinflint.co.uk. Retrieved on 2011-12-24.